[prMac.com] Missoula, Montana - illumineX delivered Squeaky, a new drifting balloon character for EyeSpy 2.1 (and higher) to the Mac App Store, today. The colorful, translucent Squeaky balloon is the most popular character among our marketing focus group and beta testers. illumineX developer Arlan Titchbourne tossed balloons around in a coffee shop to get inspiration for an all new physics model, to closely simulate the behavior of actual drifting balloons, small gusts of wind, and bouncing off the mouse cursor like a balloon off your finger. To activate Squeaky's drifting balloon motion in EyeSpy, open the Character Settings panel and choose any setting for "Motion" other than "Stationary." The balloon will begin to slowly drift. It will change direction and velocity if you bump it with your mouse cursor. It's fun to play with in idle moments, or when you need a slight distraction to get into a flow while thinking about your next task. 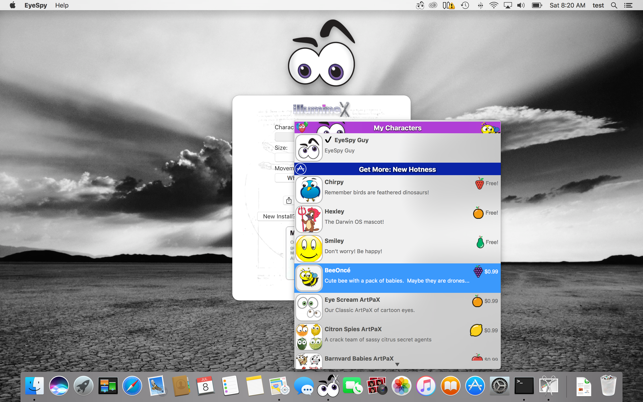 EyeSpy is a new spin on the classic toy in which cartoon eyes watch your mouse cursor as you work. EyeSpy includes free original cartoon characters developed in cooperation with professional artists as well as new characters available as In-App Purchase. Collections of new characters known as ArtPaX are also available. All characters including Squeaky can be easily shared with your friends via Messages, Twitter, Facebook and any sharing platform supported by macOS. illumineX CTO Alex Cone says, "While developing EyeSpy for the Mac, our motto was: better than it needs to be. Our drifting balloon character was just crazy. The idea seems so simple, but it cuts against the grain of the normal app behavior. We refactored twice before we were ready to ship the balloon." The Squeaky ballon character is available within EyeSpy as an in-app purchase for $0.99. EyeSpy itself is a free download. Other characters are available via in-app purchase or free download. The all new Swift EyeSpy 2 began with a conversation about trying an experiment to bring the popular toy back to the Mac. The problem was that even after 15 years off the market, people still occasionally asked for an update to this fun and silly toy, where cartoon eyes watch their mouse cursor. But simply refactoring EyeSpy to run on current versions of macOS didn't seem like The Right Thing to do. EyeSpy hadn't been touched in 15 years. It felt like the right time to wipe the slate clean and completely re-imagine the product. illumineX CEO Gary Longsine had the crazy idea to apply a modern enterprise design process to the old free toy. EyeSpy 2.1.0 is Free and available worldwide exclusively through the Mac App Store in the Lifestyle category. After you download EyeSpy, simply double-click the EyeSpy Guy character to open the Character Settings panel, where you can select new characters, download additional free characters, and purchase characters as an In-App Purchase. illumineX is available to help your enterprise or government organization rethink, redesign, and refactor your enterprise mobile apps. For more information, please contact illumineX. Squeaky the drifting balloon is available for $0.99 as an in-app purchase. illumineX helps enterprise, government, and startup clients design and build mobile and cloud software solutions. illumineX is committed to delivering quality consumer software products for Mac, iPhone, and iPad. The App Store is our resume. All Material and Software (C) Copyright 2018 illumineX, inc. All Rights Reserved. Apple, the Apple logo, macOS, iPhone, iPod and iPad are registered trademarks of Apple Inc. in the U.S. and/or other countries. Other trademarks and registered trademarks may be the property of their respective owners.